This recipes combines all of my favorite Fall flavors. 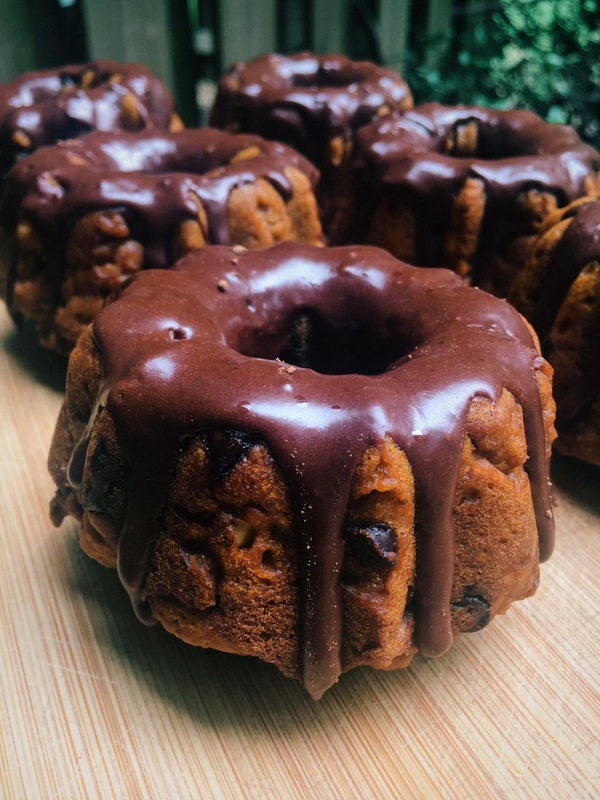 The batter for these cakes are refined sugar-free– sweetened with Coconut Sugar (which is dehydrated coconut blossom nectar) and Maple Syrup. I do not use eggs or dairy in my recipes which makes these treats Vegan. In place of butter, I used room-temperature coconut oil. In place of eggs, I use a combination of a “flax egg”, which acts as a binder, and the magic that is baking soda reacting with vinegar, which makes the batter fluffy. I’ve added mini-chocolate chips that don’t weigh down the batter (Enjoy Life has great vegan chocolate chips!) and walnuts for texture. My glaze is simple and adds just the right amount of chocolate. In a small bowl, combine first 5 ingredients-- these are your DRY ingredients. Mix next 8 WET ingredients (all room temperature!) in a larger bowl whisking out any lumps. If you've never made a "flax egg" before, do so by simply letting the flaxmeal sit in the warm water until it becomes gelatinous like a raw egg. This acts as a vegan binder. With 10 strokes, whisk in the dry ingredients into the wet. Switching to a big wooden mixing spoon, fold in the chocolate chips and walnuts using 10 more strokes. It's important not to over-mix: this over-stimulates the gluten in the flour making the cakes dense and hard. Grease the mini-bundt tray and pour all of your batter in equally. Bake for 28-30 minutes. To make the chocolate glaze, combine the powdered sugar and cocoa powder in a bowl. Using a spoon, start mixing in tiny bits of coconut milk. No more than 3 or 4 Tablespoons! Mix to consistency of a thick glaze. When the cakes are finished, let them cool before icing. Then spoon the glaze along the top so it drips down the sides. My mini-bundt form came from Pampered Chef, check them out!